The turkey was gobbling hard two ridges over. I dropped down into a creek bottom, waded the water, marched up the next hill and came upon a big thicket I’d never seen before. I’d hunted both turkeys and deer on this property for years but had never spent much time on the property’s east end. The shortest way to close the distance to the gobbling bird was straight through the jumble of honeysuckle and greenbrier. I spotted a deer trail and followed it in. As I ducked through the cover, I noticed dozens of antler-scarred trees and saplings. I stepped over old scrapes. The area was littered with deer tracks and droppings. I made a mental note to come back later in the summer and investigate further. Long story short, I didn’t get the turkey that day, but by stumbling upon that bedding area, I opened up some new opportunities for bow season. I hung several treestands along trails and funnels that fed into the thicket, and from those stands I continue to encounter bucks to this day. When we scout and hunt a property for whitetails from September through December, we typically poke around and look for rubs, scrapes and tracks. But we are reluctant to walk around too much or penetrate too deeply into the woods for fear of bumping deer. That’s good, but there’s a problem: By working only the perimeters of a hunting area, you get only a glimpse of how and where deer live and travel. During spring, however, you can walk freely in the woods and investigate every ridge, bottom and thicket for signs of deer. 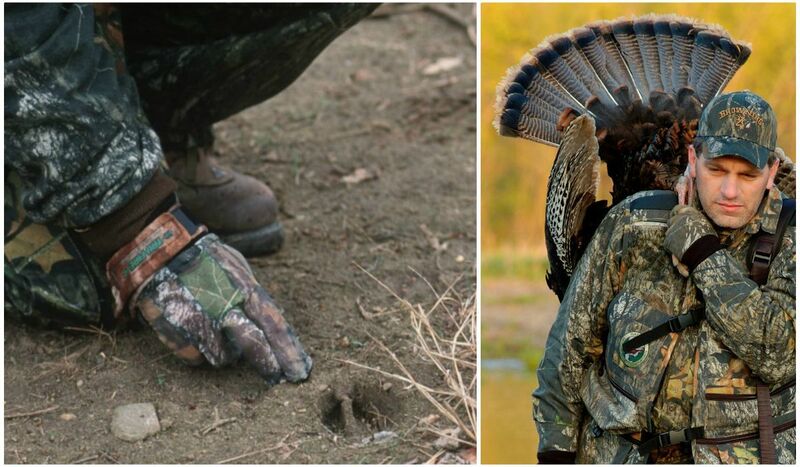 Why not kill two birds with one stone and combine your scouting with your turkey hunting in April and May? Go before the woods green up too much and while the weather is perfect. At daylight, listen for a gobbling bird and go get him if you can. Midmornings, when the turkeys go quiet, start walking. Cover every ridge, draw and creek bottom on the land. Check out every edge, thicket or swamp. Sure, you’ll bump a few deer, but who cares? You won’t be back to hunt them for another five or six months. Well-used deer trails, such as this one, will still be easy to spot during spring. As you’re walking along at midmorning, pause every few hundred yards and then cast a few yelps and cuts. You never know — a gobbler whose hens have left him for the day might strike. If the birds stay silent, then cut every deer trail you come across and follow it for a spell to see where it goes. Trails the deer use now will be fresh and muddy, but old worn trails they used last fall and winter will still be visible, too. Those old trails are the ones you need to find and follow because those are the ones a buck likely used during hunting season — and the ones he’ll use again this fall. Main trails will fork into secondary trails that link more food sources and cover thickets. Walk those too, and key in on pockets of deer sign. When a trail cuts across a creek, veers around a ridge point or drops into a ditch, take note because those funneling points are great places for trail cameras and treestands next fall. As you hike, look for deer feeding areas you might have missed or never knew about: white oaks on a ridge, a patch of greenery near a swamp, persimmons, old apple trees, etc. The same goes for small or large thickets, cutovers, weedy ditches and the like that serve as satellite or major bedding areas. Rubs and scrapes from last October and November are easy to spot in the spring woods. Look for “signpost” rubs — large, scarred trees that mark some section of a buck’s core living area. Missouri whitetail scientist Grant Woods points out that while mature bucks blaze the big rubs, many deer interact with them. “They act as communal pheromone wicks and are located in areas with high deer traffic,” Woods said. That would be an obvious spot to scout further and hang a treestand this fall. Woods has found a correlation between the number of rubs in an area and the number of older bucks that live there. On a management property in Tennessee, he’s observed an amazing 5,000 rubs per square mile, or 7.8 per acre. If you find a piece of woods lit up with rubbed trees like that, start looking for stand sites for this fall. Signpost rubs are easy to spot; keep an eye out for them during spring turkey pursuits. A cluster of scrapes at the intersection of two or three trails with big rubs nearby. This is a “rut junction” and a great spot for a trail camera. A scrape line on the edge of a linear honeysuckle thicket or a row of pines or cedars. Bucks run these edges frequently during late October and early November. It’s another great spot for a trail camera. A heavily scraped spot on a ridge 100 yards or so off a bean or cornfield. If the acorn crop is good again in the fall, bucks will stage and scrape there again. I hope you get your turkey this spring, but if not, all is not lost. The more you roam and learn the woods, and the more buck signs you find, the better your bowhunt will be this fall. Start preparing now! The biggest advantage of the diaphragm mouth call — hands-free operation — makes it an obvious choice for bowhunters. Don’t blow air across the reeds, but “huff” up air from deep in your chest. Also, work your jaw up and down when you call, just like when you talk. When a turkey is roosted alone (you don’t hear hens clucking and yelping nearby) and gobbling strong, call to him very little. Eke out a few soft tree yelps; if he gobbles right back, don’t call anymore. Wait for him to fly down and come looking for you. As you walk and call during midmorning, yelp and cut on a loud, high-pitched box call, which is dynamite for “shocking” gobbles out of quiet toms. The same is true when using a crow call.